Sezzle is a payment solution that enables you to "Shop Now and Pay Later" with simple interest-free installment plans. Sezzle breaks down purchases into four smaller payments spread over six weeks. 25% is due at the time of the transaction, with the remaining 75% due across three easy payments scheduled every two weeks. 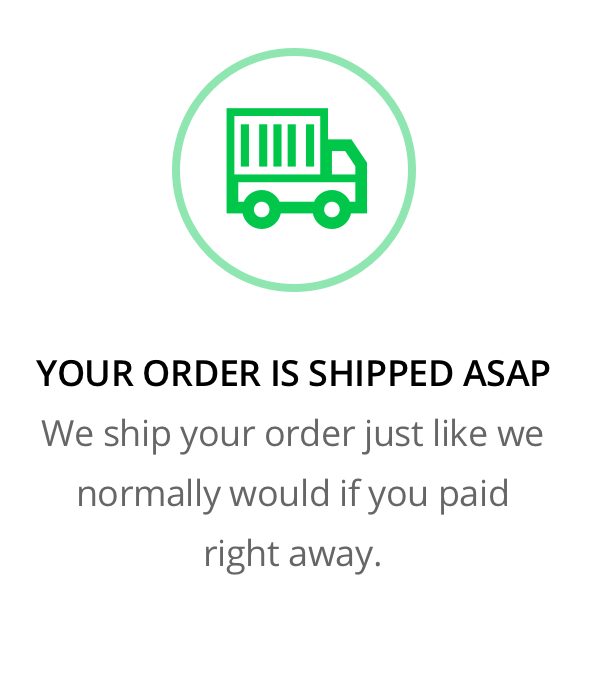 When you complete a purchase with Sezzle, we ship your product immediately. You get to enjoy the item before you finish paying for it! Sezzle automates the repayments from your bank account on file. Select Sezzle as your payment method while checking out. Sezzle's extended payment product does not qualify as a credit product per Reg Z, which means there is no "hard credit" check typically associated with credit products. No catch. Sezzle is completely interest-free for shoppers. We pay Sezzle a fee for each transaction so that we can help you Shop Now and Pay Later. The only fees you could potentially incur are failed payment fees and late payment fees. If your scheduled payment fails to process, you will be charged a $10 failed payment fee. Sezzle does their best to prevent this from happening by sending email and text reminders. Rescheduled payments will incur a $5 late payment fee. Sezzle's extended payment option does not qualify as a credit product per Reg Z, however they still pull your credit score as part of their risk check. Don't worry, this check won't have a negative impact, because Sezzle is not a credit product per Reg Z. This is considered a "soft check" of credit. Sezzle uses your credit information to help approve you, verify your identity and reduce fraud. Sezzle currently doesn't report to credit bureaus. It's fast and easy. Simply select Sezzle as your payment method during checkout. You’ll be asked to provide some basic information about yourself. Sezzle will secure the checkout using a one-time password that is sent via SMS text to the mobile number you provide. You will then be asked to login to your bank as the final step in their checkout. The entire process should take under 2 minutes for first-time Sezzle users. Secure checkout takes just a few seconds to complete for existing Sezzle users. Do you have sufficient funds available? Generally Sezzle looks to see that you have 25% of the order available to spend. The amount you have to repay on previous orders - it may help to pay some off (not a guarantee). The value of the order you are trying to place - it may help to reduce the value of your shopping cart (not a guarantee). Security is critically important. Sezzle undergoes quarterly scans and yearly audits for the highest level of compliance in the Payment Card Industry (PCI) to ensure that your data is safely stored in their systems. Sezzle is currently being certified to the top level of compliance - PCI Level 1. If you believe your order should have already arrived, you will need to contact customer service directly via phone or email. Sezzle does not handle shipping or order fulfillment, nor do they have any role in the delivery process. Additionally, Sezzle is not able to adjust or change the order once it has completed. All changes must be handled directly through customer service. Contact information should be included in your emailed Sezzle purchase receipt, or you can visit our website to find other communication options. We recommend that you allow 24 to 48 hours for us to respond to your inquiry. Contact customer service directly. 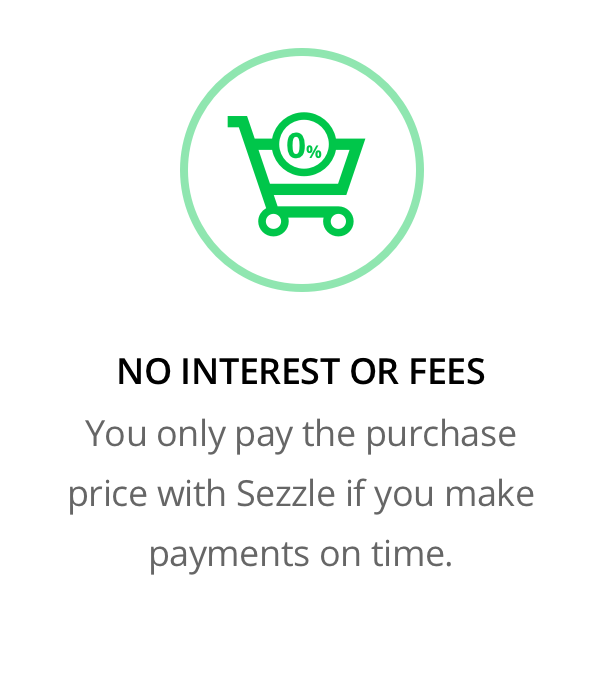 Sezzle does give you the option to dispute the purchase via your Sezzle customer dashboard, however this dispute is reserved for cases where the merchant has failed to ship your product or you suspect a case of merchant fraud. Sezzle treats disputes seriously and will ask us to provide evidence of shipment to verify that the product has shipped. If we do refund all or a portion of your purchase, we will notify Sezzle and return the necessary funds to you or reduce future installment payments. Please allow 24-to-48 hours for customer service to reply to your communications. Before Sezzle can make updates to your installment schedule, we have to be notify them that the refund has been accepted. Sezzle works closely with us to ensure that this happens as quickly as possible. All payments made to Sezzle will be refunded to you as soon as we notify them of the return. To determine the status of your return, please contact customer service directly. Contact information can be found on our website or on your Sezzle purchase receipt email. Once the refund is processed and we notify Sezzle, the changes to your installment plan are automatically applied, including any refunds due to you. Sezzle has no impact or influence on the return or refund decision. All partial refunds are applied to the installments furthest in the future, first. If the refunded amount is greater than the amount of the purchase that is outstanding, Sezzle will apply a refund to the method used to pay the installments. If the refund amount is less than the amount outstanding Sezzle will remove or reduce your future installments. For example, let's say you make a $200 Sezzle purchase (ie 4 installments of $50). You have three (3) installments remaining, and you received a $70 refund. Sezzle will remove your 4th installment and reduce your 3rd installment by $20 (now $30). Your new installment schedule would be a future $50 installment and a subsequent $30 installment, which would lead to a total payment amount of $130, matching your purchase minus the partial refund. Sezzle does their best to return your funds to you in a timely manner and in many cases your money will be returned to your account in 1-3 business days. However, depending on your payment method and other factors it may take up to 10 business days for the funds to reach your account. If you are concerned, send and email to shoppersupport@sezzle.com and they will check on the status of your refund. Yes! Sezzle encourages shoppers to pay off their account early, if possible. If you'd like to pay off your purchase early, you can do so in your Sezzle customer dashboard. If one of your automatic payment fails to complete, Sezzle will apply a $10 failure fee to the payment. The payment will be automatically retried later. Sezzle will remind you before the payment is due with text and email alerts, and will allow you to reschedule your payment. Please ensure that you reschedule your payment at least a day prior to the due date. The ability to reschedule your payment on the due date cannot be guaranteed due to variable processing times. If you have more questions about failed payment fees or rescheduling your payment, please contact Sezzle at shoppersupport@sezzle.com. Yes. In their reminder email Sezzle will allow you to reschedule payments. Rescheduling a payment will incur a $5 reschedule fee. Rescheduling a payment is limited to a date within the next 13 days. In order to guarantee your ability to reschedule your payment, you must reschedule your payment on the day prior to the payment date. If you don't pay, you’ll receive reminders from Sezzle, and you will be charged a late fee of $10. They encourage you to make your payments on time because missed payments can have a negative impact on your limits with Sezzle and your ability to use Sezzle in the future.